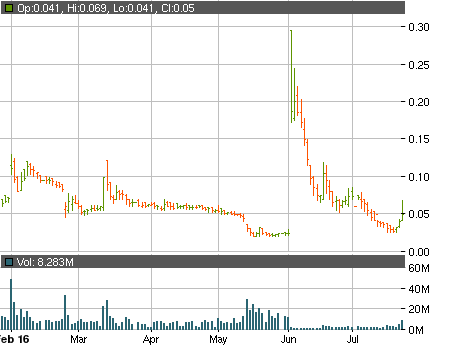 Taking a look at the chart of Ascent Solar Technologies, Inc. (OTCMKTS:ASTI) makes it immediately obvious that the past several months have been nothing short of a total nightmare for the shareholders of the company. The depreciation was truly devastating but now the stock might be in for a recovery. The last three sessions have seen ASTI surge up the chart on tremendous daily volumes. In fact, during yesterday’s trading investors shifted over 8 million shares, which is three times higher than the monthly average. How high can the positive momentum carry ASTI, though? Especially when you realize that the current uptrend is not being supported by anything substantial. The latest PR came nearly a month ago and it simply informed investors that the period of 20 business days following the 1-for-20 reverse split is now over and as a result the company will return to trading under its original “ASTI” symbol. With the red flags around the company still being as serious as ever getting overly excited might be extremely risky. Don’t forget that the reverse split had no effect on the authorized shares leaving ASTI with A/S of 450 million and plenty of room for further dilution. The 8-K filing from July 14 may have announced that the securities purchase agreement involving the company’s newly designated Series H Preferred shares has been terminated but whatever positive effect this may have had got quickly erased by the fact that the company will now simply use convertible notes instead of preferred shares. The 8-K form reveals that ASTI has entered into a private placement of up to $2.08 million worth of convertible notes while the 830 Series H shares that had already been issued were exchanged for $866 thousand worth of notes. According to the terms the notes they can be converted into common shares at the lowest of $0.045, 70% of the lowest volume weighted average price for the ten days preceding the conversion, or 70% of the lowest closing bid price for the 10 days preceding the conversion. In the occurrence of certain “triggering events” the discount will go up to 40%. By mid-August ASTI is supposed to submit its financial report for the second quarter of the year and if the company’s balance sheet shows signs of improvement the stock could reclaim even more of the positions it has lost. If the financials disappoint once again, though, the slide could take the ticker to new lows.